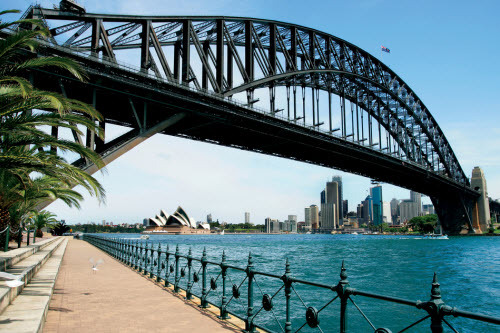 Discover cheap holiday packages to Sydney from New Zealand. With a direct flight time of only 3 hours 45 minutes from Auckland, it's one of the most affordable and closest holiday destinations for kiwis. Don't overwhelm yourself with trip planning. Keep things simple by booking a flight and hotel package deal. Webjet has exclusive package deals that include cheap flights to Sydney and hotel stays for the duration of your stay. Let us do all the hard work and find the best holiday package deal for your trip to Sydney from New Zealand. .
Sydney is the largest city in Australia and is surrounded by iconic beaches, world heritage sites and world-class wine regions. With direct flights from five of New Zealand's international airports, it's the most inexpensive ways to get to Australia, and it's a huge time-saver. Home to warmer weather and some of the most famous beaches in the world, Kiwis flock here to worship the sun gods and ride some waves. On a budget? Visit the free museums, attend a "What's On Sydney" event, and go to a backpacker bar for AUD 4-7 beers. It also has something to offer every kind of traveller. Families will have plenty of kid-friendly hotels to choose from, and there are more than enough activities to keep the little ones busy. Adventurous couples and solo travellers can learn how to surf, kayak to Shark Island or go snorkelling in Gordon's Bay. There's also a range of boutique accommodation with epic views of the city's famous skyline. Foodies will also be spoilt for choice. Sydney has both delicious and affordable food for frugal backpackers or luxury travellers wanting a first-class dining experience. Sydney's major drawcard for any traveller remains its world-famous harbour. Located near the iconic Sydney Opera House, Harbour Bridge and Luna Park, it's an extraordinary landmark that deserves a spot on any Sydney bucket list..
1. Money: The official currency is the Australian Dollar. There are plenty of ATMs located around the city, and most sotres, restaurants and hotels will aceept Mastercard and Visa. 5. Weather: The best time to visit Sydney is in November and March to May. The weather will still be warm, but you'll miss the high season crowds and prcies. Airlines also tend to have cheaper rates during these shoulder seasons, making it a more affordable time for Kiwis to visit. 6. Getting Around: The best way to get around Sydney is with the train. The City Circle line stops by a number of the city's landmarks and you'll get to miss the notoriously grid-locked traffic. .
7. Drinking Water: The water in Sydney is safe to drink from the tap. 8. Wi-Fi: Wi-Fi in Sydney is slow and expensive. If you are budget-conscious and need to get online, head to a nearby Maccas (McDonald's) and use theirs for free.